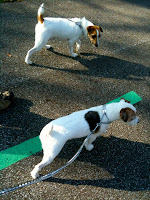 My friend Guy and I took a walk today with Sheba and Siegfried From KAOS. And what a day. Cleveland couldn't get much better for mid November. Sunny skies, little wind and close to 60 degrees. I mentioned this to Guy, a California native, and he nodded politely and appreciatively before reflecting, "Today would be about the worst day of the winter in Santa Barbara." No matter. 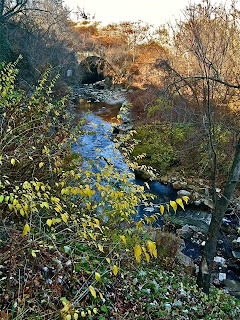 We hiked to Mill Creek Falls, took the path down the left bank overlooking the creek and before long made our way down to the creek bed. This is Cleveland. Not bad. 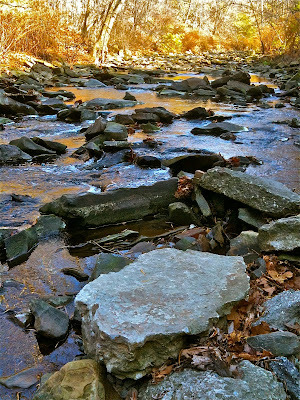 Mill Creek is exactly like a Montana stream. Only without the aquatic insects, cutthroat trout (or any fish to speak of), otters, black bears or grizzly bears. Still, it's amazing the beauty that's in my back yard, available to be enjoyed anytime just by taking the time and effort to look. 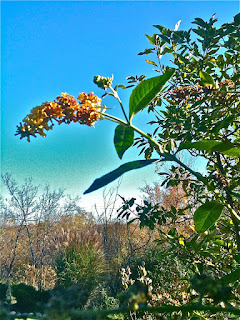 One of the coolest plants we have at CadMur Manor is Asclepias syriaca, common milkweed. 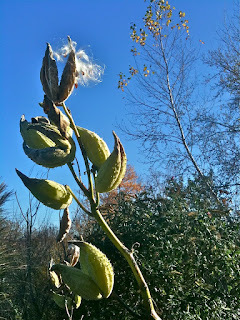 This time of year, these pods dry, crack and break open, releasing little seeds into the air to be carried to a new site in order to begin a new life cycle. 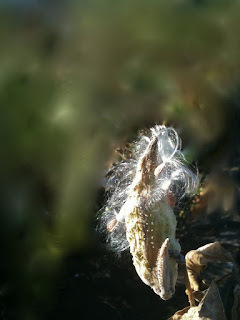 I collected a couple of small baggies full of the fluffy seeds today, setting them aside for planting next year. If you want some seeds for your pollinator garden, let me know! "Don't call anyone, please! I don't have any insurance and can't afford it." Clutching his chest as he panted and pleaded, the breathless young man knelt before us on the asphalt all-purpose Mill Creek trail -- almost directly behind CadMur Manor. "I think I'm just having an asthma attack," he said, perhaps not fully believing his own words. I pulled my phone from my pocket and began to call. "My chest just hurts like hell, and I don't have my inhaler with me. I've had these before, and I think I'll be okay. I just can't pay for an ambulance or a trip to the hospital, so please don't call 911. I had to get X-rays for my shoulder once and got stuck with a $2,000 bill," he added. This kid could die because he is afraid of getting socked with a bill he can't afford -- making this a compelling healthcare reform anecdote, I thought to myself -- before returning quickly to the moment, to the person in front of me. Until now I had ignored his request, dialing the numbers 9-1-1 and pressing "call" as he talked. Now turning to Sophie, my RN wife, for guidance she nodded to hold off a moment while she assessed. I hit "end call." Only minutes before Sophie and I had just hit the trail with our dogs for a late afternoon stroll. It was late Friday, the day before Halloween, and the temperature hovered at 72 degrees. At the bottom of the hill below the community center, we exchanged greetings with a young couple less than half our age apparently returning from a walk. We discussed our options: left toward Mill Creek Falls or right toward the Garfield Park Nature Center. As we talked, I noticed the man's distressful movements on the ground to our east, toward the nature center, at a distance of about 150 feet. Racing toward the man to help, I was passed as if running in slow motion by that young couple, also running to the man for assistance. No time for vanity, I thought. The couple had been standing a few feet behind us and saw the young man struggling a split second after I did. Now they arrived before I did. Just for good measure, a neighbor, Kellie, came out of nowhere pushing her baby stroller, bringing the total of would-be saviors to five (six counting Kellie's four-month-old, Daniel, and eight counting our canine companions). The young asthmatic identified himself as Kyle, 26, a neighbor who lived across Turney Road on one of the side streets. He was en route to his girlfriend's house, taking the trail toward the nature center as a short cut. He was clean cut, with short hair beneath a baseball-style cap -- the type with a flat brim, which he wore slightly to one side. Now catching his breath and standing steadily, Kyle cautioned us from walking toward the falls. "There are a bunch of druggies down there smoking dope," he said. "You don't want to go down there." Kyle underestimated Siegfried and Sheba's protective instincts and ferocity, I thought. (They killed a skunk, dude! You should read this blog.) Nice, though, that Kyle was protecting his would-be rescuers. Nurse Sophie had made up her mind. We wouldn't call 911 but instead would walk with Kyle toward his girlfriend's to ensure he was okay. Kyle accepted our offer, the young couple turned to go off in the opposite direction and Sophie, Kellie, Daniel, Siegfried, Sheba and I walked with Kyle the half mile or so to Sladden, the side street Kyle headed to. I liked Kyle, a second-shift worker at a machine shop. He goes to school during the day, he said, hoping one day to become a fire fighter. He has a three-year-old daughter, but apparently doesn't live with her or the girl's mother. But he spoke about spending as much time with her as he could. His job now doesn't provide health insurance, at least not until he has been there awhile longer. Did he say he'd have to be at the same job a full year before being eligible for healthcare benefits? I don't remember now. As we walked the last few hundred feet before reaching Sladden, Kyle noticed I was wearing a Shaker Heights Police Department sweatshirt, which I acquired during a citizen-police program I was in two years ago. "Are you a retired police officer?" Kyle asked. Oh, vanity. Thanks for keeping me humble, Kyle. I wish you a long, healthy and happy life. 63 number of children who said, "I love your dogs!" 52 temperature, in fahrenheit, at 6 p.m.
49 temperature, in fahrenheit, at 7:04 p.m.
5 percent of trick-or-treaters who made no attempt to wear a costume; went as a "human being" or a "student"